Provide comfort for the family of Terry Floyd with a meaningful gesture of sympathy. 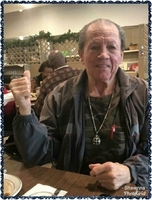 Mr. Terry Floyd, 76, of Hot Springs, Arkansas, passed away March 13, 2019, in Tyler. He was born December 2, 1942 to Roy Neal & Buna Widner Floyd. He grew up in Hot Springs and lived in Dallas and Houston before moving back to Hot Springs 25 years ago. 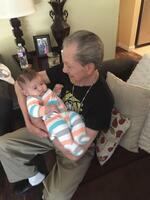 He enjoyed fishing and being a grandfather to his grandkids and great-grandchild. Terry was preceded in death by his parents; and sister, Jacquelyn Reynolds. Survivors include his son, Terry Neal Floyd II of Houston; daughter, Shawnna Hewitt of Mineola; brother-in-law, Tommy Reynolds of Hot Springs; two grandsons, Dalton Fehl of Grand Saline and Nicholas Floyd of Houston; one great-grandchild and one on the way; and numerous other relatives and friends. To plant a memorial tree in honor of Terry Neal Floyd, please visit our Heartfelt Sympathies Store.